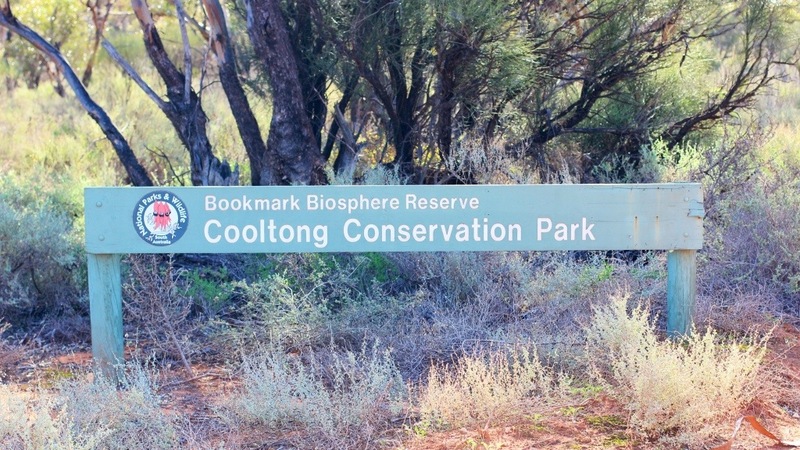 WX – Fine, 17 degrees C.
Today’s Terrific weather saw me and my oldest lad Josh head out in to the scrub to activate the Cooltong Conservation park, for the VK5 Parks award. (Josh needs to get his hours up on his “L” plates so he was keen to be my chauffeur!) . Access is via Santos Rd, off the Sturt Highway, a few km’s out from Berri towards Renmark past the Gun Club. 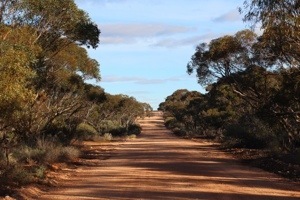 This is a dune and Mallee scrub park, some 3700 Hectares and is home to many wonderful species of birds and animals. It’s not that far from my home and Josh had us there in about 20 minutes. The road is quite good for a few Km into the park where it starts to deteriorate somewhat but all in all it’s quite serviceable, especially if you have a 4WD or a capable SUV. In summer I would imagine that it would be passable to most vehicles but the recent heavy rains had still left the road boggy in sections with water still in the many ruts. 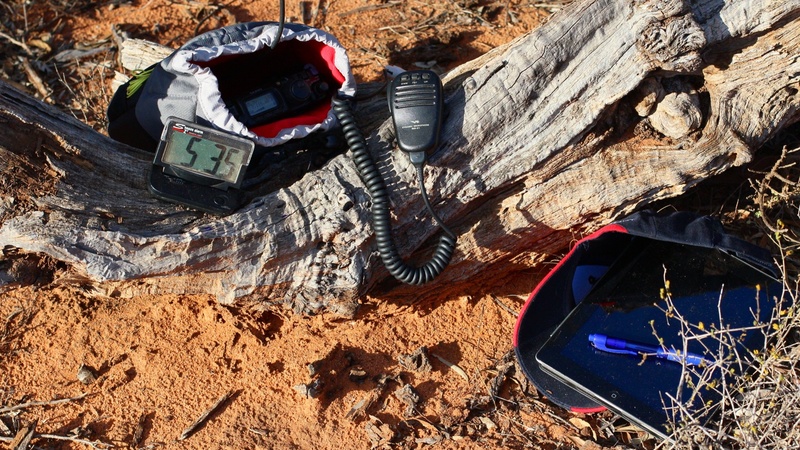 After finding a good spot I set up the squid pole and the End Fed Half Wave antenna with the FT817ND and started calling CQ…I use the iPad for SOTA goat alerts and many other tasks…I log the calls in a paper notebook! I was rewarded quickly with several stations, including a few out on SOTA summits – Nice!…the sun on my back was delicious!!! The following stations made it in to my log…VK5BJE John, VK3MNZ Don, VK5KX Peter, VK5FMID Brian, VK3AFW Ron on VK3/VW-009, VK5AIM Steve, VK5KBJ Barry, VK5FTCT John, VK3XY Derek, VK3ZPF Peter, VK5KC David, VK3MRG/P Marshall on VK3/VN-027, VK5LY Larry, VK3ANL Nick,VK2UH Andrew, VK5FTTC Rod and VK3UBY Colin. I ran in to a few issues…1. 40 M with the introduction of SOTA is now VERY busy with stations all over the central bit of the band – finding a spot to call CQ can be a challenge!!! 2. Morons tuning up over the top of other stations…3. Even bigger Morons calling CQ on a very obvious “in use” frequency. One particular VK2 F-call was displaying all the qualities of getting his foundation licence from a cereal box!!! 4. Splattering stations…some were so bad they were being heard many KCs away…and yes my noise blanker and preamp were OFF!!! I’m thinking I might be getting some cancellation of radiation if the angle off the “L” bit of the wire is less than 90 degrees at the top of the squid pole (see the 3rd Photo)…something to experiment with!!! See you in the next Park or Summit!!! This entry was posted in VK5 National and Conservation Parks and tagged AHARS, Conservation, Cooltong, Park, Portable. FT817, SANPCPA, VK5 Parks Award. Bookmark the permalink. ← Cheap Chinese Handhelds…so what are they really like? Thanks Andy for the contact. You did really well. I thought the VK2 must have been deaf! Sorry I didn’t get an opportunity to call you. Marija and I were on our way back home from Whyalla, and caught up with some really good friends at Pt Pirie for lunch. Well done on another activation mate. Sounds like you had fun. I have my EFHW set up as an inverted V and it performs the same as a 1/2 wave dipole. 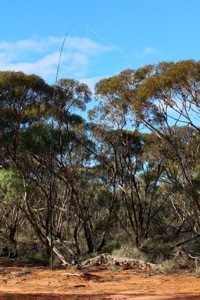 Ron VK3AFW and I did side by side tests with our 2 antennas from the Moorabin Radio Club to VK1MA in Canberra. They performed the same. 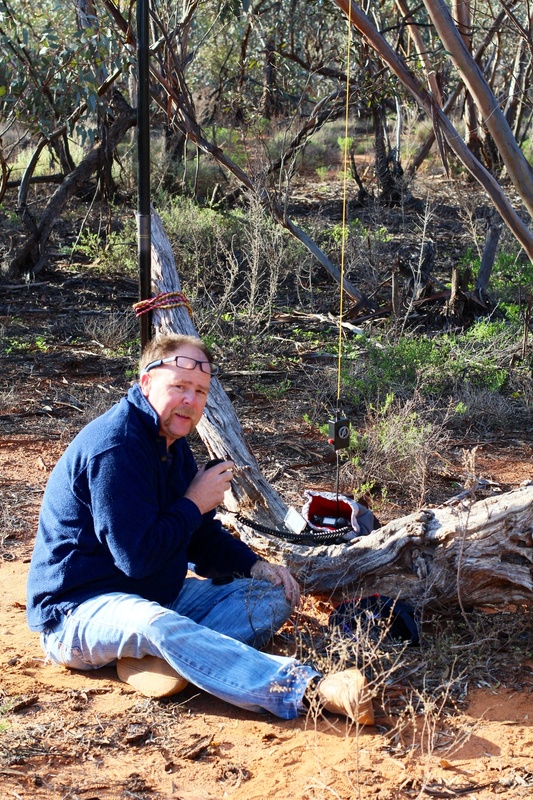 When I was on Mt Ginger Ale I set it up as a long wire, only due to the location of the squid pole support. Check my post on Ginger Ale.